This tasty NYC-style falafel sandwich recipe is inspired by the 24-hour middle eastern restaurants that line the streets of Brooklyn and Manhattan. 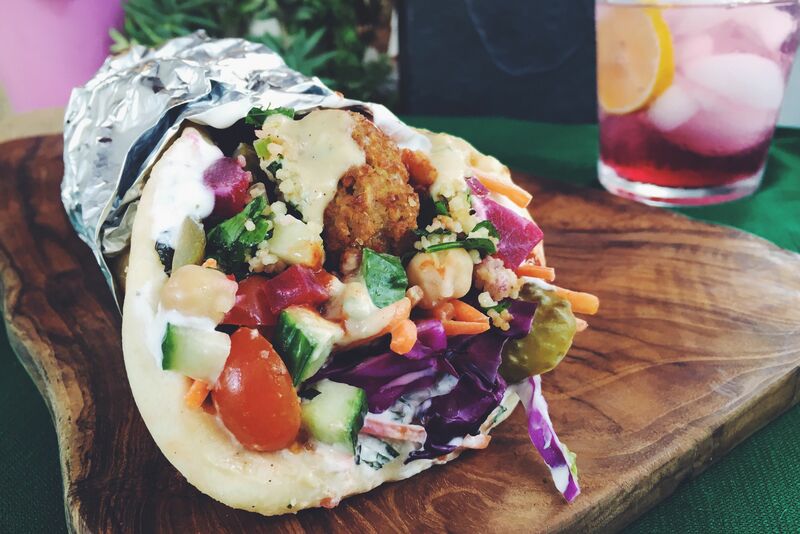 Fresh fried falafel balls, pickled vegetables, herbs, greek yogurt, and a quick and easy lemon garlic tahini dressing are stuffed into a warm pita and drizzled with hot sauce if desired. These crispy lamb burgers covered with rich tzatziki, refreshing mint, sweet roasted tomatoes, and spicy red onions on a toasted ciabatta bun will make your next BBQ so much better. Want more options? If you're a cheese lover, try adding salty feta cheese or crumbled ricotta salata. Don't want to eat all that bread? Try stuffing miniature whole wheat pitas for a healthy twist. This Greek chicken souvlaki gyro sandwich recipe uses fresh marinated chicken which is cooked over a hot grill and then stuffed into a warm pita and topped with homemade tzatziki, tomato, onion, lettuce, and fresh dill. This delicious Indian Spiced Lamb sandwich is made with graham masala spiced meatballs which are then simmered in a rich, creamy, and sweet korma sauce, topped with tart yogurt and fragrant mint chutney. Crispy slices of spiced lamb, juicy ripe tomatoes, crunchy red onions, creamy tzatziki sauce, crisp cucumbers, leafy spinach and tangy feta cheese are nestled in a buttery and airy piece of pita bread in this delicious spiced lamb gyro. Quick pickled slaw, made with carrots, cucumber, onion, mint and cilantro, paneer cheese, and yellow curry sauce get grilled between two crispy pieces of naan bread to make one Indian-style grilled cheese that is crisp and fresh. This robust and flavorful curry chicken salad sandwich is made with a mixture of greek yogurt and mayonnaise, so it has a much lighter taste with more health benefits than your typical calorie packed chicken salad. Greek yogurt not only provides a nice tangy bite, but it's also full of probiotics and live cultures that help aid digestion and speed up metabolism. Curried meatballs, cherry peppers, and Thai basil come together between two buttery toasted slices of French bread on these flavorful little curried meatball sliders. For a variation of this recipe, try swapping out the red curry for yellow curry and add crushed peanuts, pickled bamboo shoots, and a citrusy carrot slaw. You can also use a green curry base and a few more toppings like fresh bean sprouts, a few sprigs of mint and cilantro, and a squeeze of fresh lime juice. This simple and delicious hummus and pickled vegetable sandwich is anything but boring! Say goodbye to lifeless limp vegetables and start piling on loads of these tangy pickled veggies, some savory protein-packed hummus, and crisp, fresh produce. These veggies are just my recommendation and personal preference but feel free to try switching up the veggies to create a sandwich that's full of flavor and chocked full of vitamins and nutrients.